Short Video Clip by CANTWO traveling to and painting at the UK BRING THE PAINT Festival! Check the fantastic fresh mural of German Iconic Graffiti artist CANTWO (SUK Crew) in Leicester painted recently! At the age of 7, CAN2 had a driving need to artistically improve his desk at school as well as his school books with his own illustrations. In 1983, his first fledgling attempts at spraying took place in his hometown of Mainz, Germany. His inspiration from the very start originated in the Mecca of Graffiti, the Bronx. 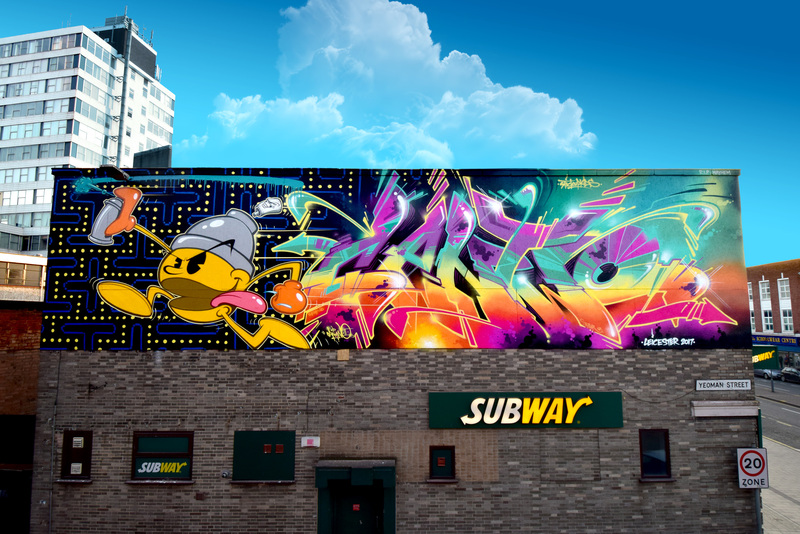 CAN2 represents the Bronx style of the early 80s in his view the only true graffiti style from the start. CAN2 sprays letters that have a dynamic impact. Most of this spraying is accomplished on walls. His distinctive characters have a diorama effect and are markedly alive. The difference between his characters and those of other sprayers are to be found in the shading and of course in his distinctive style. Follow the Artist on Facebook or his website!